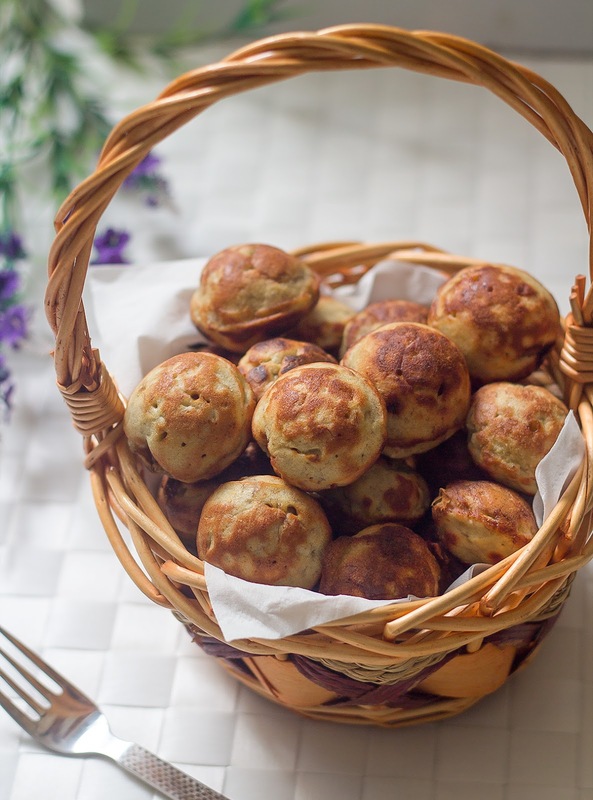 Banana Kuzhipaniyaram | sweet paniyaram | vaazhaipazha paniyaram is an easy and healthy breakfast recipe which can be taken as a evening snack too. Some paniyarams are made with maida and this one I have made with whole wheat flour. 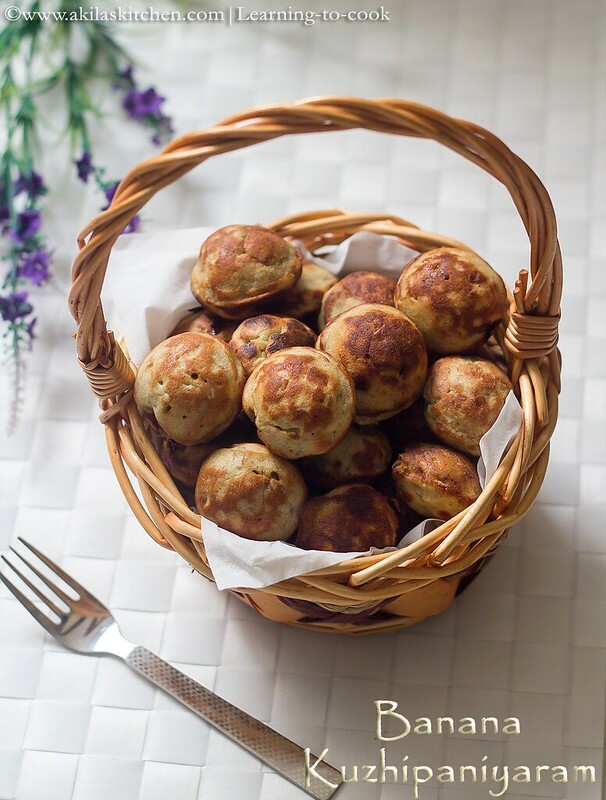 Easy Banana Kuzhipaniyaram | sweet paniyaram | vazhaipazha paniyaram recipe with easy step by step pictures for your easy understanding and learning. After a months gap, I am back again with the easy and healthy Banana kuzhipaniyaram recipe. This I tried on my own, with some trial and error methods and with the left over banana. First 2 times, it was bit chewy as the water was more and does not come out correctly.. Third time, with my mom’s help, tried and it came out good. Every one enjoyed it. 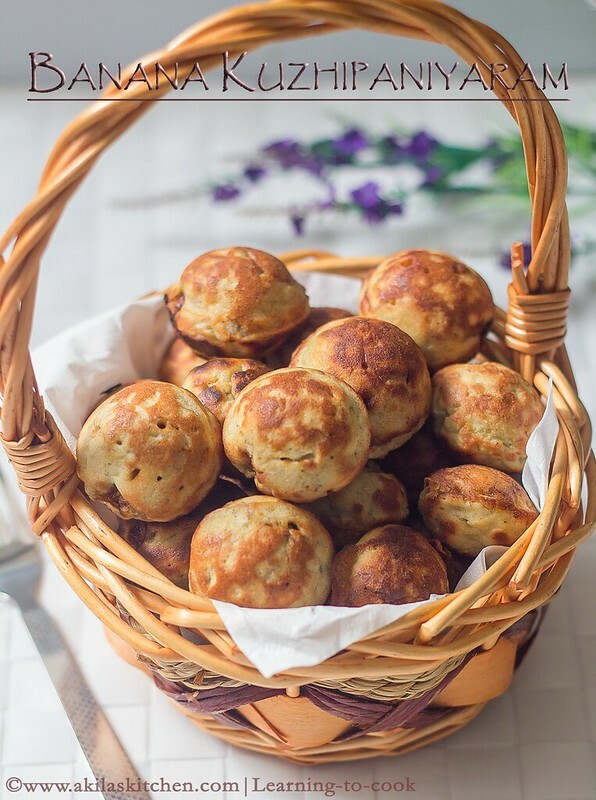 Do try with banana kuzhipaniyaram and let me know how it turned out for you. 1. Smash the ripe banana with a spatula and add all the ingredients mentioned above except oil and water. Add water slowly and mix slowly. 2. Make a thick paste. (Bit thicker than idli batter). Grease the paniyaram pan moulds, with the oil and heat it. Add the batter using a tbsp to the pan, cover and cook in medium flame. 3. After 3 min, check one paniyaram, whether you can turn it. If you can turn, turn, each paniyarams, upside down with the help of a stick or a spoon. 4. Again cook it for another 2 – 3 min on that side also. If needed, you can add drop of oil to the moulds. Check whether they are cooked, by inserting a toothpick, and it comes out clean. Remove the Paniyarams from the moulds and serve it hot. 5. Since it is sweet paniyaram, we had it just like that without any side dish. 1. 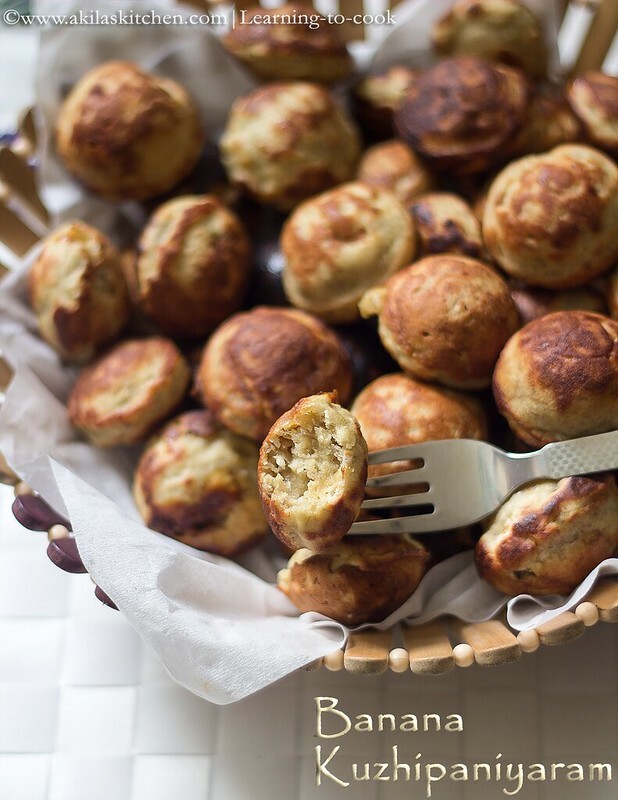 You can do this paniyaram with solely wheat flour or the apf itself. 2. Add the jaggery according to the sweetness of the banana. If you want you can replace palm jaggery also. 3. Add water, little by little, until the batter comes to thick consistency. Smash the ripe banana with a spatula and add all the ingredients mentioned above except oil and water. Add water slowly and mix slowly. Make a thick paste. (Bit thicker than idli batter). Grease the paniyaram pan moulds, with the oil and heat it. Add the batter using a tbsp to the pan, cover and cook in medium flame. After 3 min, check one paniyaram, whether you can turn it. If you can turn, turn, each paniyarams, upside down with the help of a stick or a spoon. Again cook it for another 2 – 3 min on that side also. If needed, you can add drop of oil to the moulds. Check whether they are cooked, by inserting a toothpick, and it comes out clean. Remove the Paniyarams from the moulds and serve it hot. Since it is sweet paniyaram, we had it just like that without any side dish. 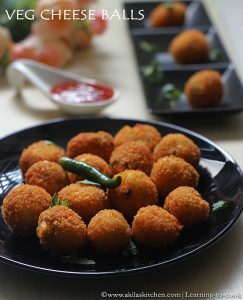 You can do this paniyaram with solely wheat flour or the apf itself. Add the jaggery according to the sweetness of the banana. If you want you can replace palm jaggery also. Add water, little by little, until the batter comes to thick consistency. *Post first published on Sep 29th 2014. Post updated with recipe. Basket full of goodies…happy to grab them all…nice presentation!!! 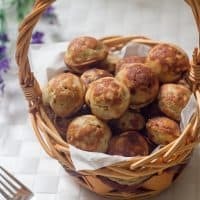 I can munch few rite now, addictive paniyarams..
delicious looking perfectly made paniyarams..
that's an interesting recipe. Must try it out. lovely looking dish, never made it with sweet, have to try this. Isn't all purpose flour a type of wheat flour? What's that wheat flour? Wholewheat flour? Flavorful delicious paniyarm. Looks inviting. Third attempt and it turned out so good. I don't have the pan, so I suppose I can bake? ?